Samantha received her Doctor of Physical Therapy degree from the University of New England in 2016. Samantha has spent time working in several different clinical settings, including outpatient workers compensation, outpatient Veterans Affairs, and inpatient acute care. Samantha has a strong applied exercise science background through her undergraduate schooling and being a personal trainer. 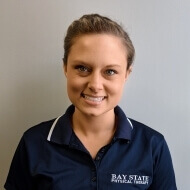 Samantha’s interests and experience include pediatrics, orthopedic/sports rehabilitation, concussion screening and management, and vestibular rehabilitation. Samantha was a dancer for 16 years and also has an interest in dance injury rehabilitation. Samantha enjoys working with young athletes and volunteering at local races, sharing her knowledge of running, strength and conditioning. Samantha enjoys being physically active including participating in outdoor activities and training at the gym. Samantha enjoys interior decorating, traveling, and spending time with family and friends.